An axle is a central shaft for a rotating wheel or gear. On wheeled vehicles, the axle may be fixed to the wheels, rotating with them, or fixed to the vehicle, with the wheels rotating around the axle. In the former case, bearings or bushings are provided at the mounting points where the axle is supported. In the latter case, a bearing or bushing sits inside a central hole in the wheel to allow the wheel or gear to rotate around the axle. Sometimes, especially on bicycles, the latter type axle is referred to as a spindle. On cars and trucks, several senses of the word axle occur in casual usage, referring to the shaft itself, its housing, or simply any transverse pair of wheels. Strictly speaking, a shaft which rotates with the wheel, being either bolted or splined in fixed relation to it, is called an axle or axle shaft. However, in looser usage, an entire assembly including the surrounding axle housing (typically a casting) is also called an axle. An even broader (somewhat figurative) sense of the word refers to every pair of parallel wheels on opposite sides of a vehicle, regardless of their mechanical connection to each other and to the vehicle frame or body. Thus, transverse pairs of wheels in an independent suspension may be called an axle in some contexts. This very loose definition of "axle" is often used in assessing toll roads or vehicle taxes, and is taken as a rough proxy for the overall weight-bearing capacity of a vehicle, and its potential for causing wear or damage to roadway surfaces. Axles are an integral component of most practical wheeled vehicles. In a live-axle suspension system, the axles serve to transmit driving torque to the wheel, as well as to maintain the position of the wheels relative to each other and to the vehicle body. The axles in this system must also bear the weight of the vehicle plus any cargo. A non-driving axle, such as the front beam axle in heavy duty trucks and some two-wheel drive light trucks and vans, will have no shaft, and serves only as a suspension and steering component. Conversely, many front-wheel drive cars have a solid rear beam axle. A straight axle is a single rigid shaft connecting a wheel on the left side of the vehicle to a wheel on the right side. The axis of rotation fixed by the axle is common to both wheels. Such a design can keep the wheel positions steady under heavy stress, and can therefore support heavy loads. Straight axles are used on trains (that is, locomotives and railway wagons), for the rear axles of commercial trucks, and on heavy duty off-road vehicles. The axle can optionally be protected and further reinforced by enclosing the length of the axle in a housing. A tandem axle is a group of two or more axles situated close together. Truck designs use such a configuration to provide a greater weight capacity than a single axle. Semi trailers usually have a tandem axle at the rear. Axles are typically made from SAE grade 41xx steel or SAE grade 10xx steel. SAE grade 41xx steel is commonly known as "chrome-molybdenum steel" (or "chrome-moly") while SAE grade 10xx steel is known as "carbon steel". The primary differences between the two are that chrome-moly steel is significantly more resistant to bending or breaking, and is very difficult to weld with tools normally found outside a professional welding shop. An axle that is driven by the engine or prime mover is called a drive axle. Modern front-wheel drive cars typically combine the transmission (gearbox and differential) and front axle into a single unit called a transaxle. The drive axle is a split axle with a differential and universal joints between the two half axles. Each half axle connects to the wheel by use of a constant velocity (CV) joint which allows the wheel assembly to move freely vertically as well as to pivot when making turns. In rear-wheel drive cars and trucks, the engine turns a driveshaft (also called a propellor shaft or tailshaft) which transmits rotational force to a drive axle at the rear of the vehicle. The drive axle may be a live axle, but modern rear wheel drive automobiles generally use a split axle with a differential. In this case, one half-axle or half-shaft connects the differential with the left rear wheel, a second half-shaft does the same with the right rear wheel; thus the two half-axles and the differential constitute the rear axle. Some simple vehicle designs, such as leisure go-karts, may have a single driven wheel where the drive axle is a split axle with only one of the two shafts driven by the engine, or else have both wheels connected to one shaft without a differential (kart racing). However, other go-karts have two rear drive wheels too. 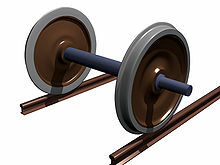 A dead axle, also called a lazy axle, is not part of the drivetrain, but is instead free-rotating. The rear axle of a front-wheel drive car is usually a dead axle. Many trucks and trailers use dead axles for strictly load-bearing purposes. A dead axle located immediately in front of a drive axle is called a pusher axle. A tag axle is a dead axle situated behind a drive axle. Dead axles are also found on semi trailers, farm equipment, and certain heavy construction machinery serving the same function. On some vehicles (such as motorcoaches), the tag axle may be steerable. In some designs the wheels on a lazy axle only come into contact with ground when the load is significant, thus saving unnecessary tire wear. Some dump trucks and trailers may be configured with a lift axle (also known as an airlift axle or drop axle), which may be mechanically raised or lowered. The axle is lowered to increase the weight capacity, or to distribute the weight of the cargo over more wheels, for example to cross a weight restricted bridge. When not needed, the axle is lifted off the ground to save wear on the tires and axle, and to increase traction in the remaining wheels. Lifting an axle also alleviates lateral scrubbing of the additional axle in very tight turns, allowing the vehicle to turn more readily. In some situations removal of pressure from the additional axle is necessary for the vehicle to complete a turn at all. Several manufacturers offer computer-controlled airlift, so that the dead axles are automatically lowered when the main axle reaches its weight limit. The dead axles can still be lifted by the press of a button if needed, for better maneuverability. Lift axles were in use in the early 1940s. Initially, the axle was lifted by a mechanical device. Soon hydraulics replaced the mechanical lift system. One of the early manufacturers was Zetterbergs, located in Östervåla, Sweden. Their brand was Zeta-lyften. The liftable tandem drive axle was invented in 1957 by the Finnish truck manufacturer Vanajan Autotehdas, a company sharing history with Sisu Auto. A full-floating axle carries the vehicle's weight on the axle casing, not the halfshafts; they serve only to transmit torque from the differential to the wheels. They "float" inside an assembly that carries the vehicle's weight. Thus the only stress it must endure is torque (not lateral bending force). Full-floating axle shafts are retained by a flange bolted to the hub, while the hub and bearings are retained on the spindle by a large nut. In contrast, a semi-floating design carries the weight of the vehicle on the axle shaft itself; there is a single bearing at the end of the axle housing that carries the load from the axle and that the axle rotates through. The full-floating design is typically used in most 3/4- and 1-ton light trucks, medium duty trucks and heavy-duty trucks, as well as most agricultural applications, such as large tractors and self-propelled agricultural machinery. There are a few exceptions, such as many Land-Rover vehicles and in American stock car racing since the early 1960s. The overall assembly can carry more weight than a semi-floating or non-floating axle assembly, because the hubs have two bearings riding on a fixed spindle. A full-floating axle can be identified by a protruding hub to which the axle shaft flange is bolted. The semi-floating axle setup is commonly used on half-ton and lighter 4x4 trucks in the rear. This setup allows the axle shaft to be the means of propulsion, and also support the weight of the vehicle. The main difference between the full- and semi-floating axle setups is the number of bearings. The semi-floating axle features only one bearing, while the full-floating assembly has bearings in both wheel hubs. The other difference is about the axle removal. To remove the semi-floating axle, one has to remove a wheel first. And, if such axle breaks, the wheel is most likely to come off the vehicle. The semi-floating design is found under most 1/2-ton and lighter trucks and SUVs and rear-wheel-drive passenger cars, usually being smaller or less expensive models. A benefit of a full-floating axle is that even if an axle shaft (used to transmit torque or power) breaks, the wheel will not come off, preventing serious accidents. ^ Mechanical Engineering design (9th ed.). McGraw Hill. 2010. p. 360. ISBN 0073529281. ^ "Ring & Pinion". Retrieved 9 October 2013. ^ "using a lift axle". Truck driver. The Trucker's Report. Retrieved 28 December 2011. ^ Zahl, Timothy (October 2016). "Axle Glossary: The A-to-Z List of Definitions". CARiD.com. Wikisource has the text of the 1911 Encyclopædia Britannica article Axle.